Jean Segura led the way with a 3 for 4 night with a 2-run home run, 2 runs scored and a stolen base, and Gerardo Parra added 2 triples, an RBI, and 2 runs scored. Matt Garza came off the DL and took advantage of 3 double plays to pitch 6 scoreless innings. The final score of the game was 8-1 as the Brewers won their 4th in a row after the All Star break. They have now won 17 of their last 23. 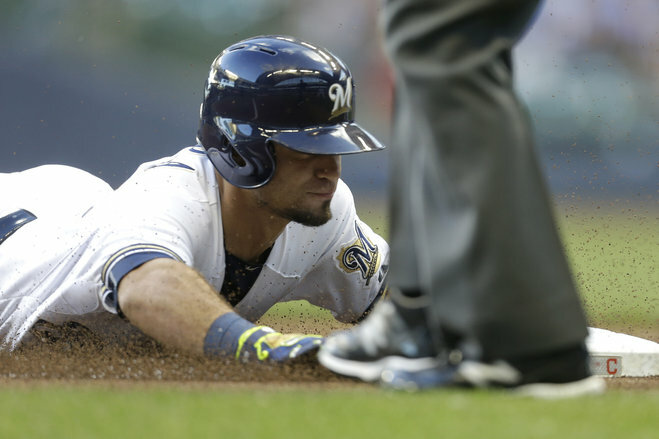 The Brewers’ winning streak was halted at 4 games as Kyle Lohse gave up 2 more home runs, including a 3-run home run that erased a 4-1 lead in the 3rd inning. Lohse gave up 5 runs on 10 hits in 5 innings and he suffered his 11th loss of the season. Adam Lind hit a 3-run home run in the 1st inning and went 4 for 5 with 4 RBIs. Gerardo Parra, Jonathan Lucroy, and Scooter Gennett each had multi-hit games in a losing effort. The Brewers lost by a final of 7-5. The Brewers were shut down by the Diamondbacks’ Zack Godley, who struck out 7 in 6 shutout innings in his Major League debut. Mike Fiers struck out 10, but he gave up 5 runs in 5 innings to take his first loss since June 17. Ryan Braun hit a 3-run home run in the 9th, but it was too little too late as the D-Backs won 8-3. Braun hit a home run for the second consecutive game and Jimmy Nelson earned his team-leading 8th win with 7 shutout innings. Francisco Rodriguez allowed his first run in a save situation, but still managed to remain a perfect 22 for 22 for the season in the Brewers’ 2-1 victory. Taylor Jungmann had a rough first inning in which he gave up 2 runs. Those 2 runs proved to be the only ones that were scored in the game, giving Milwaukee its third loss in 5 games this week. The Brewers loaded the bases in the 9th inning with 2 outs, but Parra was caught looking to end the game. Garza flirted with trouble in his 5.2 innings, but he limited the damage to 3 runs. Unfortunately for the Brewers, the offense could not capitalize and they were held scoreless again. They went 0-9 with runners in scoring position. Khris Davis had an especially bad day, striking out 4 times and dropping a ball for an error in the 3rd. The 3-0 loss gave them a 1-3 series loss and a 2-4 record for the week. Lind came out of the game on Saturday with tightness in his back. He missed Sunday’s game and it is not clear when he will return. Lucroy took his place at first base. Aramis Ramirez was traded to the Pittsburgh Pirates. Ramirez has been the Brewers’ third baseman since signing with the club in 2012. He signed with the Brewers as a free agent after the 2011 season.